Leading Manufacturer of cancer management pack from Chennai. CANCER patients can come out of their distress to a great extent using the below mentioned CANCER MANAGEMENT PRODUCTS.1000's of Cancer Patients around the world are using these products and have turned near normal status very quickly. 1. GEOPATHIC STRESS NEUTRALIZER PADS: Geopathic Stress has been identified as a major contributor for CANCER afflication. 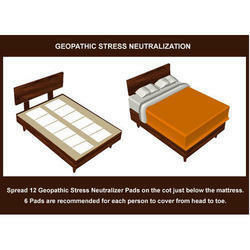 Geopathic Stress Neutralizer Pads help to Neutralize the dreaded Geopathic Stress in the Bed area instantly. Spread 12 Nos Geopathc Stress Neutralizer Pads below your Mattress and do away with Geopathic Stress....... and regain your original immune power which helps to keep cancer away. 2. OXY LIFT OXYGEN SUPPLEMENT: This is an Oxygen + Nutritional supplement. When consumed along with water, OXYLIFT helps to create enormous beneficial oxygen within you body and pervades every cell of the body with Oxygen. This in turn helps to cull out the toxins including the cancer affected cells from the body. Secondly Oxygen helps to prevent further spread of the cancerous cells, as cancerous cells cannot grow/spread under oxygenated conditions. 3. SCALAR ENERGIZED T SHIRT: The Scalar Energized T shirt helps to maintian the body electrical voltage at optimum 80 milli volts, whereas for cancer affected parsons it is likely to come down to 20 - 30 milli volts. 4. ENERGIZED RUDRAKSHA : Dip the Energized Rudraksha in Water for 10 minutes and the water will become very high in frequency and energy. Drink this water to enhance the body frequency , to retain the Life Force Energy/Prana. You may view detailed description about individual products , elsewhere in the website. PRICE PER PACK: Rs.6450/-. Courier FREE. Looking for Cancer Management Pack ?